Go where it is darkest: When company, country, currency and commodity risk collide! You learn valuation (and find out how much you don't know) by valuing businesses and companies, not by talking, reading or ruminating about doing valuation. That said, it is natural to want to value companies with profit-making histories and a well-established business models in mature markets. You will have an easier time building valuation models and you will arrive at more precise estimates of value, but not only will you learn little about valuation in the process, it is also unlikely that you will find immense bargains, because the same qualities that made this company easy to value for you also make it easier to value for others, and more importantly, easier to price. I believe that your biggest payoff is in valuing companies where there is uncertainty about the future, because that is where people are most likely to abandon valuation first principles and go with the herd. So, if you are a long-term investor interested in finding bargains, my advice to you is to go where it is darkest, where micro and macro uncertainty swirl around every input and where every estimate seems like a stab in the dark. I will not claim that this is easy or comes naturally to anyone, but I have a few coping mechanisms that work for me, which I describe in this paper. While I enjoy valuing companies with uncertain futures, there are cases where my serenity about valuation is disturbed by the coming together of multiple uncertainties, piling on and feeding of each other to create a maelstrom. In this post, I want to focus on two companies, one Brazilian (Vale) and one Russian (Lukoil), where bad corporate governance, a spike in country risk, currency weakness and plunging commodity prices have conspired to devastating effect on their stock prices. You could adopt the very dangerous contrarian strategy that Vale and Lukoil must be cheap simply because they have dropped so far, but I don't have the stomach for that. I do believe, though, that if I can find ways to grapple with this risk, there may be opportunity in the devastation. Vale is one of the largest mining companies in the world, with its largest holdings in iron ore, incorporated and headquartered in Brazil. Vale was founded in 1942 and was entirely owned by the Brazilian government until 1997, when it was privatized. 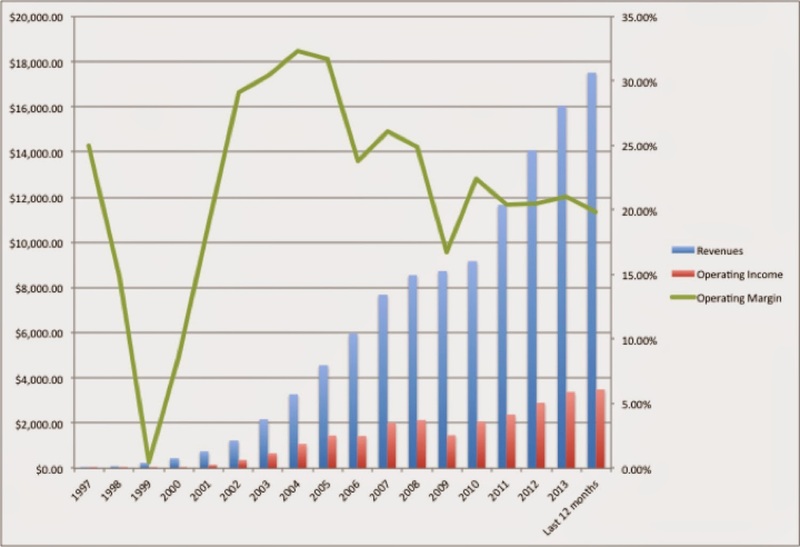 In the last decade, as Brazilian country risk receded, Vale expanded its reach both in terms of reserves and markets well beyond Brazil, and its market capitalization and operating numbers (revenues, operating income) reflected that expansion. Notwithstanding this long-term trend line of growth, the last year has been an especially difficult period for Vale, as iron ore prices have dropped and Brazilian country risk has increased (leading into a presidential election that was concluded in October 2014). 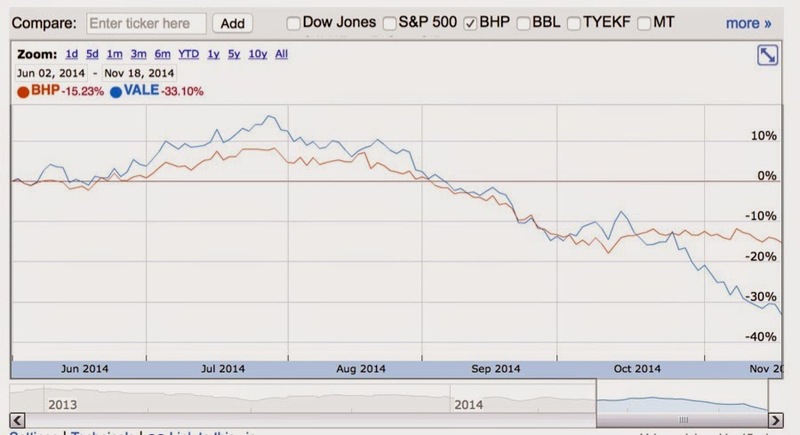 The graph shows Vale's stock price over the last 6 months (and contrasts it with another mining giant, BHP Billiton). While declining commodity prices have affected both companies adversely, note that Vale’s stock price has dropped more than twice as much as BHP’s stock price has. 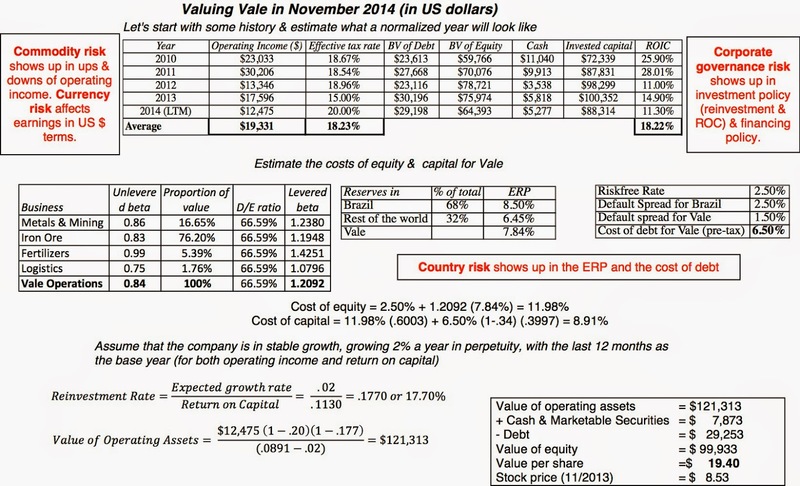 In fact, Vale has lost approximately $130 billion in market capitalization since 2010. Though there are fundamental reasons for the stock price decline at both Vale and Lukoil, the fear factor is clearly also at play, because these companies are exposed to risk not only to commodity and country risk but there are also significant concerns about corporate (or is it political) governance at both companies as well as currency risk factors (as both the Brazilian Real and the Russian Ruble have slid over the last few months). In a post on Alibaba, I made the argument that corporate governance affects value by making it more difficult (if not impossible) to change management, and thus increasing the risk that a company that embarks on the wrong course may continue on that path unchecked. With both Vale and Lukoil, there are both explicit and implicit reasons to believe that investors in these companies will have little or no say in how the company is run. The place to start analyzing corporate governance is the ownership structures of the company. With Vale, the first sign that corporate governance is weak is the fact that they have two classes of shares (and yes, I would make this argument about Google and Facebook as well). In the graph below, I break down the top stockholders in both classes. The common stockholders, who control the composition of the board of directors and the voting rights of the company, are held by Valepar, a shell entity controlled by inside investor groups. If you own Vale shares, as I do, it is very likely that you own the non-voting preferred shares and that you have no say in who sits on the board of directors and how the company is run. There is also a wild card in this equation in the form of a golden share that is owned by the Brazilian government, giving it veto power over major decisions and the line between corporate and political governance becomes a fuzzy one. While Vale is nominally an independent company, the Brazilian government reserves the right to intrude in its management, and that power can be used to good and bad effects. The positive is that it gives Vale a leg-up on competition in Brazil, giving it first dibs on Brazilian reserves of iron ore, and the negative is that the company can become a pawn in political games. Much of Vale's success in the last decade came from a willingness on the part of the Brazilian government to give it free rein to be run as a profit-making entity, but the machinations leading up to the last election (where the incumbent, Dilma Roussef, was viewed as more likely to interfere in the company's operations) have taken their toll. (The damage has been even greater at Vale's dysfunctional twin, Petrobras, Brazil's oil company). 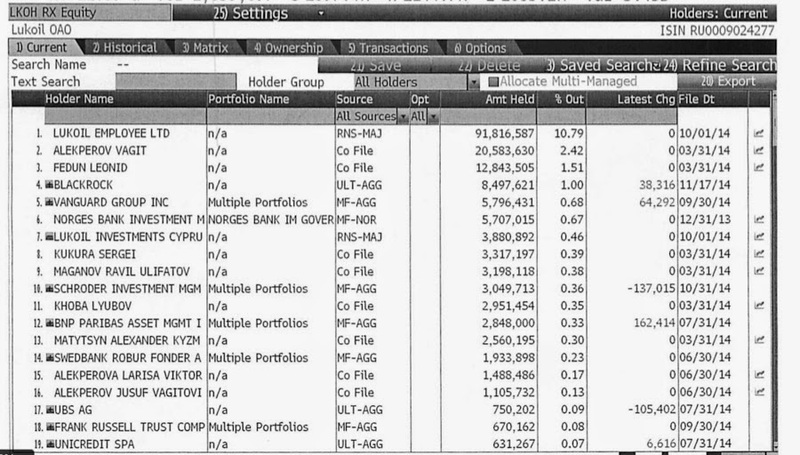 The lead stockholder is Vagit Alekperov, formerly Russian deputy minister for oil production. It is entirely possible that he accumulated substantial knowledge about the oil business, while in the ministry, and brought that knowledge and entrepreneurial zeal into play in founding Lukoil, but it is also likely that he used his connections with the power elite to get reserves at well below fair-market prices in building up the company which would make him obligated to maintaining good relations with the inner circles of Russian government. In September 2004, ConocoPhilips bought 7.6% of Lukoil's shares to create what it termed a strategic alliance, which it increased to close to 20%, before selling its stake in 2011 at an undisclosed price, partly to Lukoil and partly in the open market. It is a sad commentary on corporate governance in Russia, that Lukoil, in spite of its flaws, is a paragon of stockholder accountability, relative to most other Russian companies. Notwithstanding this relative standing, if you are considering buying shares in the company, it should be with the recognition that you will have no role in how the company is run (no matter what you read about corporate governance on the company's website). While investing is always risky, it is riskier in some countries than others, partly because of where the countries are in terms of its life cycle (with growing emerging markets being more volatile than established mature markets), partly because of the overlay of political risk in the countries and partly because of the effectiveness or lack thereof of legal protection and enforcement of property rights. When valuing companies, you have to factor in where the company operates to measure its exposure to country risk and incorporate that risk into an expected return. It goes without saying that Lukoil, which has 90.7% of its reserves in Russia, is affected by Russian country risk. Here again, the last decade has been a good one for both Russia and for Lukoil, as lower country risk (measured with the CDS spread) for the former has gone with higher market capitalization for the latter. To investors who were expecting more of the same, this year must have been a shock, as Russian country risk surged in the aftermath of the events in the Ukraine. In both companies, country risk has clearly played a role in the drop in stock prices. With Vale, at least, it cannot explain the entire price drop, since Vale has dropped more than the Bovespa over the last few months and a lot more than the index over the last few years. With Lukoil, a greater portion of the blame can be attributed to country risk. When valuing individual companies, it is generally good practice not to be a currency forecaster and to value the company based upon prevailing exchange rates (current and forward, from the market). It is also undeniable that currency movements in your favor will make a bad investment into a good one, just as currency movements against you can turn a good investment into a bad one. With Vale, the stage was set in a decade where the Brazilian Real strengthened against the US dollar, even though inflation in Brazil was much higher than inflation in the US. As with country risk, the currency risk dragon has turned on investors and the last few weeks has seen a meltdown in the value of the Brazilian currency. The story is similar for Lukoil. 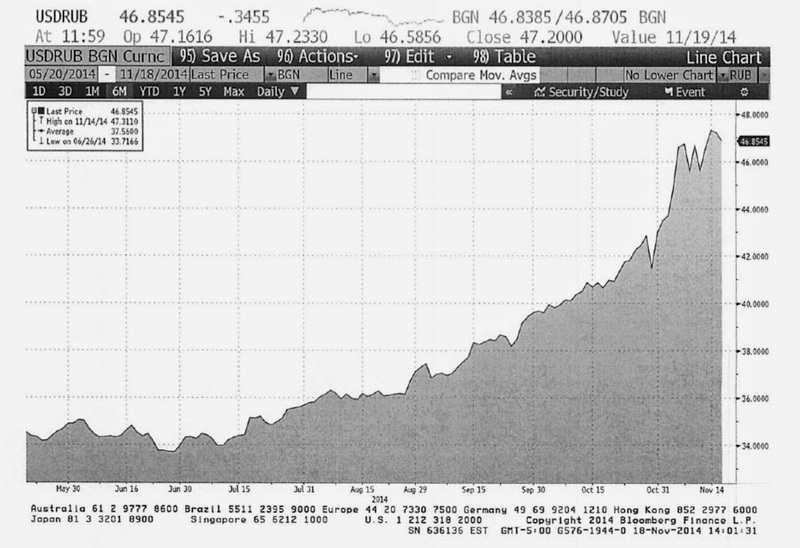 A decade of a strengthening ruble, in spite of fundamentals that would suggest otherwise, has been followed by the collapse in the last few months. While the immediate effect of a currency decline is that your investment in these companies will be worth less in US dollar terms (simply because of the translation effect), it is debatable what the effect of a weakening currency will be on both companies over time. To the extent that their reserves are in Brazil (at least for iron ore, for Vale) and in Russia (for Lukoil), the costs are in the local currencies but their revenues are in global markets, denominated in US dollars. Thus, a weakening of the currency can improve profit margins and increase value. Do commodity prices affect the value of commodity companies? Stupid question, right? Of course, they do, but the degree of impact can vary across companies. Higher commodity prices will generally push up revenues and to the extent that the cost of developing reserves stays stable, operating margins will increase. In some cases, though, and especially so with oil companies, the government can use a heavy hand (see political risk in the corporate governance section) and force the company to sell oil at subsidized prices to consumers in the country, effectively creating a subsidy cost for the company that will increase with oil prices. 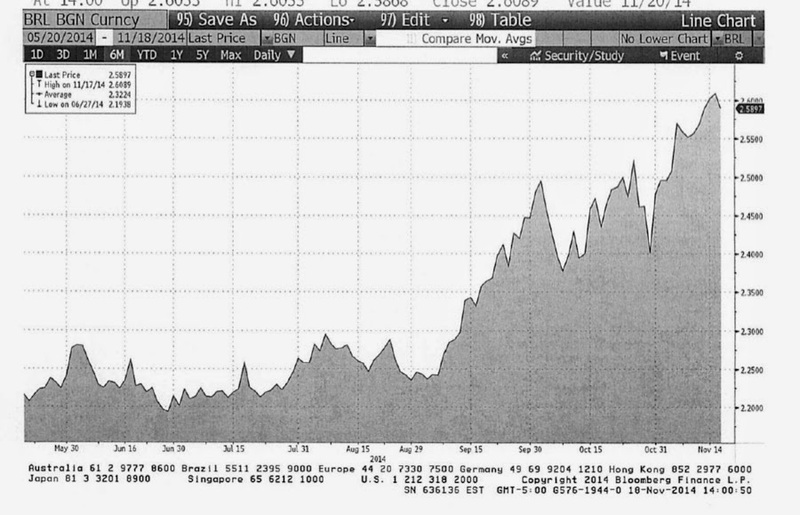 This history shows why making a judgment about a normal price for iron ore is so difficult to do. If your historical perspective is restricted to just the last few years, the current price of iron ore (about $75/tonne) is low but extending that perspective to cover a longer time period (say 20-25 years) may suggest otherwise. Lukoil also benefited from the increase in oil prices in the last decade, driven partly by geopolitics and partly by the explosive surge in automobile sales in emerging markets. Here again, though, the last few months have seen a decline in oil prices to less than $80/barrel. As with iron ore, the question of whether oil prices have dropped below a normal price is largely a function of perspective, with the answer being yes, if you have 2 or 3-year perspective but not if you have a ten-year or longer perspective. While it is easy to make the argument that commodity prices move in cycles and that what goes down has to go back up again, these cycles are unpredictable and can stretch over long time periods. Thus, you could have spent the entire 1980s waiting for oil prices to go back up, just as you would have waited the entire last decade for the drop back in prices. Operating income: The operating income in the trailing 12 months, through November 2014, was $12.48 billion, well below the operating income in the last fiscal year ($17.6 billion) and the average operating income over the last five years ($17.1 billion). To estimate the cost of capital, I built off the US 10-year treasury bond rate as the risk free rate and used an equity risk premium of 8.25%, reflecting a weighted average of the equity risk premiums across the countries where Vale has its reserves (60% are in Brazil). You can check out the spreadsheet yourself and change the numbers. I have summarized the valuation in the picture below. Note that I have attempted to incorporate the effect of commodity price declines and currency devaluation in the base-year operating income, choosing to value the company, using the depressed income from the last 12 months. The effects of corporate governance are captured in the investment and financing choices made by the firm (with reinvestment and ROIC measuring the investment policy and the debt mix in the cost of capital reflecting financing policy). Finally, the country risk is incorporated into the equity risk premium (where I used risk premium weighted by the geographic distribution of Vale’s reserves) and the default spread in the cost of debt. The value per share that I get with this combination of assumptions is $19.40, well above the share price of $8.53 on November 18, 2014. I am sure that I am missing something but at the stock price of $8.53 on November 18, 2014, it looks grossly under valued. Even in my worst case scenario, where operating income drops another 20% from the already depressed LTM number and the company earns only its cost of capital from this point on, my value per share is $13.60. 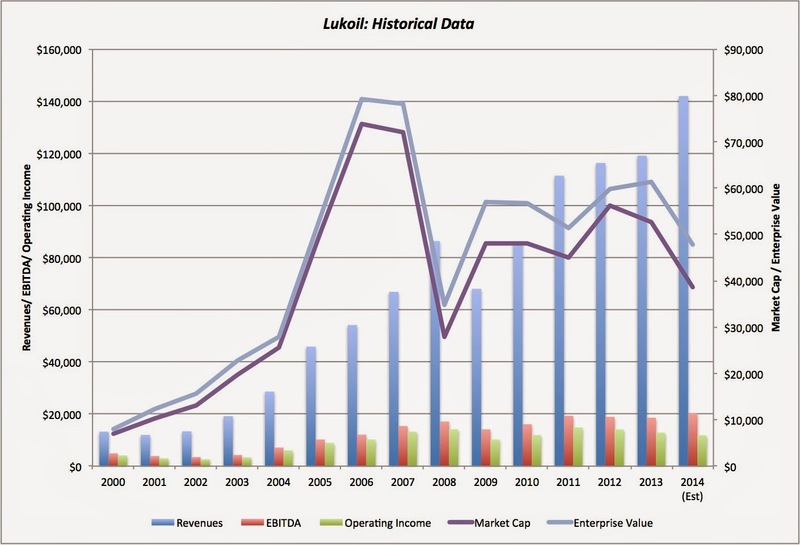 I followed a similar path for Lukoil. In my base case, I left operating income at 20% below the estimated 2014 and valued the firm as a stable growth firm (with a 2% growth rate) and with a cost of capital that reflects an updated equity risk premium for Russia (9.50%). Even if I assume that oil prices drop by another 20% and that the standoff over Ukraine will not end soon (translating into higher equity risk premiums), the value per share that I get is $50.56, higher than the stock price of $45.30. At $45.30 a share on November 18, 2014, I am again either missing something profound or the stock is massively under priced. Here again, you can download the spreadsheet and make your own choices. It is easy to come up with reasons not to buy Vale and Lukoil right now and wait for things to get better. Could things worse? Of course? With Vale, there are two Doomsday scenarios. In the first, and I hope that this does not happen, more for the sake of my Brazilian friends more than because of concerns about my investment portfolio, Brazil could become Argentina, with spiking country risk and shaky ownership rights. In the second, Chinese infrastructure investment comes to a standstill and iron ore prices drop back to pre-2003 levels. I think that these are low-likelihood events and that is precisely why I already own Vale (and I am not in the least bit ashamed to admit that I bought my shares at $12/share) and plan to add to my holdings. With Lukoil, there is the Putin wild card, where the troubles in Ukraine expand into Poland, Hungary and the rest of the old Soviet empire. That, combined with a collapse in oil prices, would make me regret my investment, but I plan to buy Lukoil to my portfolio, and live with the discomfort of having no power to exert change. After all, at the right price, you can live with a lot of discomfort! If you are tempted to complain about how much uncontrollable risk you face investing in Vale and Lukoil, keep in mind two facts. The first is that they are bargains precisely because of the uncertainty, as global investors flee from he companies, abandoning good sense along the way. The second is that it could be worse, since you could be holding Petrobras (instead of Vale) and Rosneft (instead of Lukoil) where the concerns are multiplied. Twitter's Bar Mitzvah! Is Social Media coming of age? Life's transitions, from single to married, from renter to homeowner, and from employed to retired, just to name a few, are never easy, since the rules change, as do the measures of success and failure and that is perhaps the reason that they are accompanied by ceremonies (weddings, housewarming, retirement parties). The life of a business is also full of transitions, and not only are they just as difficult for investors, traders and managers, but they often occur without ceremony, and can go unnoticed. In the last three years, social media companies have claimed center place in market conversations, first when they went public at prices that old-time value investors found inconceivable, and then as their ups and downs became part of market lore. In the last few weeks, we have seen this fascination with social media companies play out again, first in the market reaction to Mark Zuckerberg's post earnings statements about Facebook's future investment needs and then in Twitter’s struggles to reclaim its narrative at its analyst meeting last week. I get a sense that we are on the cusp of a transition, where the time for pure story telling (and its metrics) is ending and more traditional metrics (revenues, profitability) will come to the fore. That does not presage, as some are suggesting, the end of the social media party and a collapse of social media market capitalizations, but it does mean that investors, traders and managers have to recalibrate to a different game, where they will be judged not on pure sector momentum but on their capacity to cull winners from losers and find the right metrics for making those judgments. In an earlier post, I made the argument that the center of gravity in both valuing and pricing shifts as a business evolves from an idea to a product to a profit-generating business. The figure below summarizes those shifts and expands on the implications. When a business is at the idea stage, both value and price are driven by market potential and by narrative, rather than numbers. As the business transitions to a product phase, the questions become more specific, with both investors and traders looking at how well the product/service attracts customers, with usage statistics driving pricing. Further along the life cycle, the test becomes whether usage can be converted to revenues and revenues to profits, with numbers driving narrative. The table also highlights what I see as the biggest dangers at each stage of the life cycle. In the early phases, the dependence on the macro story (the macro delusion) can lead investors to value companies in a promising market too highly, in the aggregate. The perils become more company-specific as you move through the life cycle. The social media sector is a young one, with even its most established companies are still only a few years old, even if you throw Google into the mix. In the last three years, the first wave of social media companies have been listed in public markets and investors have had to price them. 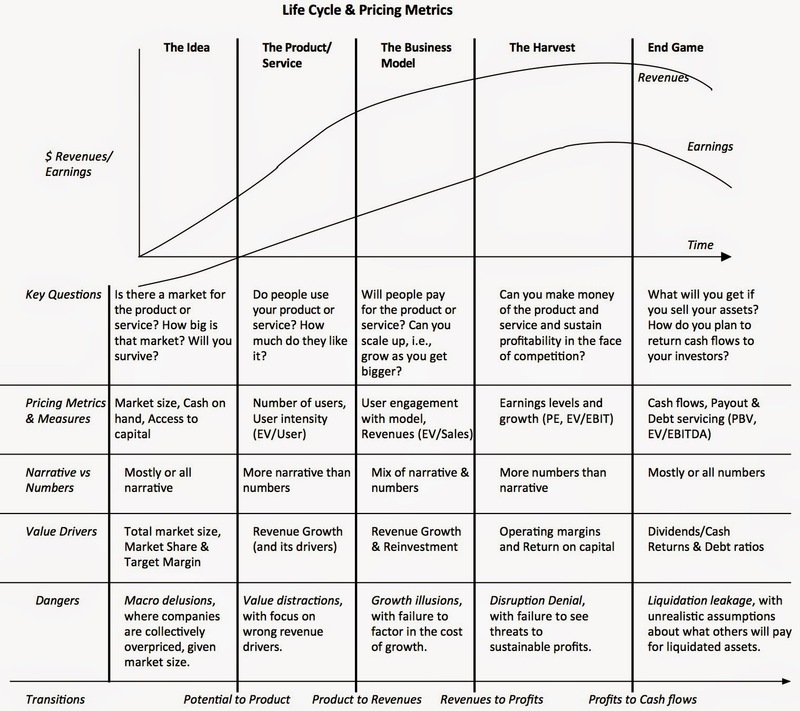 Using the life cycle framework developed in the last section, these companies were priced using “macro” stories about market potential (online advertising) generally, with revenue drivers (number of users, subscribers or downloads) more specifically determining market standing. That is neither surprising nor irrational, and reflects what investors have typically done in other young sectors (dot com in the 1990s, for instance) in the past. As the social media sector ages (and technology companies should have their lives measuring in dog-years, aging much faster than the rest of the market), the question becomes whether we are approaching a transition point, where investors start asking more pointed questions about revenue growth (and what it is costing) and profitability. I may be jumping the gun but the market’s shocked reaction to Mark Zuckerberg admitting that Facebook will be spending a lot to generate growth and Twitter’s attempt to sharpen its narrative suggests that the shift is close. Consequently, if you are an investor, a potential investor or manager in a social media company, it is time for a reality check, both to prepare for the transition and to make better decisions. While these reality checks will vary across social media companies, there are a few that I think apply specifically to those that are in the online advertising space. We don't know much about the effectiveness (or lack thereof) of social media advertising: While companies have jumped on the social media advertising bandwagon, the evidence on whether it is effective is mixed, partly because it is still too early to pass judgment. It is true that social media sites can use the information that they have accumulated about users to sharpen advertising focus, but I have not found many comparative studies that indicate that social media advertising is more effective than traditional (television or other) advertising. As someone who has never clicked on a sponsored tweet and finds them intrusive, I may be out of the loop, but I would be glad to hear from anyone who has strong evidence on this issue. In fact, surveys of advertising executives at the companies that use social media advertising show that they are just as unsure about this experiment and are withholding judgment. Source: Mashable, Does Social Media Advertising Really Work? The online ad market is growing but it is finite: At the risk of stating the obvious, the total advertising market is a finite one, since it is a cost item to (advertising) businesses, who have to watch their bottom line. It is true that online advertising is a growing part of the total advertising budget, but it also, by definition, finite. One troubling aspect of the sales pitches for social media companies that I have heard over the last few years has been an unwillingness to be specific about the size and limits of the online advertising market. Last year, when I valued Twitter for its IPO, a company that was promoted for its online advertising potential, I examined this question by looking at both the size of the overall advertising market and what percentage of it was in online (digital) advertising. Recapping and updating, global advertising revenues have grown about 4% a year for the last 5 years, and online advertising has surged from less than 5% of total advertising revenues, in 2008, to 25.76% of revenues, in 2014, with an increasing portion attributable to mobile advertising. Allowing for growth in the total advertising market and an increase in the online advertising share of it yields an estimated market of between $209 billion and $323 billion for the entire online advertising market in 2023. It is this market that social media companies are competing for and the revenues for each of them has to be measured against this whole. The Online Ad market is getting more competitive: The growth potential of the online advertising market is attracting new entrants, some of whom are still private (like Snapchat) and some in the process of being created. While much of the initial growth in social media companies has come at the expense of other types of advertising (print media, in particular), growth will become harder to find as online advertising becomes a larger piece of the pie. It is a given that at some point, sooner rather than later, the revenue growth at one online advertising company will have to come at the expense of another online advertising company. 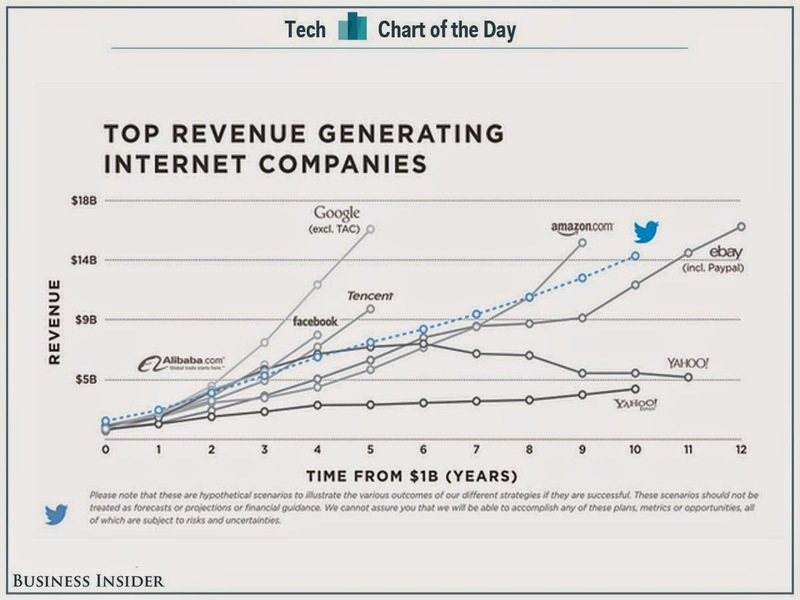 Thus, if you assume that Twitter will have revenues of $35 billion in a decade, you will then also have to identify the losers in the market (Facebook? Google?). This additional competition will also lead to pressure on operating margins, with companies cutting prices to get revenue growth, making the trade off between revenue growth and profitability front and center. Growth will become more expensive and the accounting will remain opaque: As social media companies compete for a slower-growing online advertising market, they will have to reinvest more to generate growth. That reinvestment, though, will often take forms that accountants still do not categorize as capital expenditures and will not show up in balance sheets (as assets) or on cash flow statements (as capital expenditures). It will take the form of R&D, customer acquisition costs, product development costs or acquisitions of other companies in the space (often with stock, rather than cash) and none of these are dealt with well or consistently by accountants. Customer acquisition costs, R&D and product development costs are treated as operating expenses (when they should be considered to be capital expenditures) and stock-based acquisitions often disappear into thin air (or the footnotes to financial statements). The result of this confusion is that financial statements for social media companies don’t measure what they claim to: income statements do not measure earnings, balance sheets do not reflect the assets owned and the capital invested to get them and cash flow statements are skewed by the use of equity (to compensate employees and pay for new investments). While all of these have been true for the entire existence of social media companies, they can be glossed over in the early phases but cannot (and should not) be overlooked as companies age. Unexplainable volatility: During transition periods, there will be struggles that play out in markets between investors on either side of the transition, some holding on to the old metrics and measures and others moving on to new metrics. With social media companies, the former will include investors who still focus on users and user intensity measures to price companies, whereas the latter will look at revenues, investment and earnings. The market will reflect this schizophrenia on the part of investors, with wild and completely unpredictable swings in prices, as one group or the other tries to assert its dominance. Market shake out: As the focus shifts to revenues and earnings, the market will start culling the herd, knocking down the prices of the losers and sustaining the pricing of the winners. The game will change for both traders and investors; traders will no longer be able to ride sector momentum (as they can in the early phases of a life cycle) and investors will find a bigger payoff to focusing on fundamentals. Macro to micro focus: When a sector is young, the game belongs to the story tellers and especially those who tell macro stories (about shifts in the business and disruption). As the sector matures, it shifts to those who bring the more prosaic skills of assessing individual companies to the forefront. If this is a transition, there is stormy weather ahead but that can work to your advantage, and if you can keep your wits and make it through, you will be rewarded. Manage for investors, not analysts: Don't operate under the presumption that the equity research analysts that tout your stock are market leaders and trend setters. Equity research analysts are more followers than leaders, creatures of momentum rather than arbiters of value and catering to their fickle demands will not protect your stock from getting battered, if the market mood turns. Be transparent in your accounting: Dispense with the games that you may have played in the past. Stop adding back stock-based compensation to come up with adjusted EBITDA and acting like acquisitions made with stock really cost you nothing. It is true that accounting rules are neither logical nor consistent and that you may be bound by them in preparing your financial statements, but your pro-forma statements can be used to reveal more about your business (rather than to obscure it). Twitter has its work cut out for it. It has to either find ways to grow much faster than it is projecting or it has to work at bringing investor expectations down, with the caveat that there are no soft landings for high-flying companies. If online advertising remains Twitter's primary business, getting the break-even revenues ($30-$40 billion) will be problematic, partly because of external factors (more competition and limited advertising budgets) and partly due to internal constraints (limits on the sponsored tweets users will accept in their time lines). There remains the possibility, perhaps even a probability, that Twitter will be able to find other ways to monetize their user base (retailing, for instance) but that is a work in progress, and the operating margins in these new businesses will not come close to the 25% operating margin that I am assuming for the online advertising business. As I watched and read about the Twitter extravaganza, I was reminded of the ancient Jewish tradition (mirrored in other religions) of "bar mitzvah". In that ceremony, a Jewish adolescent "come of age", studying the Torah and with the guidance of a rabbi. The ceremony is designed to put the world on notice that the child has become an adult, with the associated responsibilities and accountability. Realistically, no one expects overnight changes, since a teenager will still be a teenager after the ceremony, but it still serves as an important reminder that the rules are changing. As an aside, the seeking out of venture capital by a start-up can be analogized to a much earlier and more painful ceremony that all Jewish infant boys have to go through, with the pain of giving up a slice of your business going with the relief when it is done. Though the notion of a ceremonial coming-of-age for companies may strike you as outlandish, that is the role that getting listed in a public market played in the decades before the 1990s. Thus, companies like Apple and Microsoft both had established business models before they went public in the 1970s and 1980s. The rules changed in the 1990s, when dot-com companies leapfrogged the process to go public much earlier in the life cycle, and as that trend has continued in the social media space, investors and managers have invented new (and sometimes bizarre) metrics to cope. It may not be a bad idea to have the equivalent of corporate bar mitzvahs, where investors, traders, and managers are reminded that a company has come of age. My one reservation with Twitter's bar mitzvah was that Anthony Noto, Twitter's CFO, seemed to be playing the role of the rabbi (because of his street cred with analysts) in the ceremony, with equity research reports operating as scripture. I think it is wisdom, not street credentials, that you look for in a rabbi and timeless truths, not passing glory, in your holy books. The Twitter ceremony would have been a lot more persuasive, if Warren Buffett had been officiating, reading out of Ben Graham's Security Analysis. Perhaps, next time! Focus Pocus: Is breaking up a cure for corporate attention deficit disorder? I could start this post by telling you that some of my best friends are corporate strategists, but I would be lying. I do have a few strategists as acquaintances, but perhaps not after this post. In my cynical view, the primary contribution of corporate strategy seems to be to supply buzzwords that can be used by managers to distract investors and justify the unjustifiable. In an earlier post, I highlighted some of these words of mass distraction, including disruption, synergy and strategic considerations, and argued that the repeated usage of these words by a manager, analyst or investor is a signal that the numbers don't work. In this one, I want to add focus to that list of words, as it shows up with increasing frequency in the context of corporate break ups. In this post, I propose to put focus under the microscope, using EBay (and its proposed break up) as my illustrative example. Focus, the new strategic buzzword? Notice that the “focus” shows up twice in Ms. Whitman’s brief statement and five times in Mr. Donahoe’s conference call brief. If you count in the use of the words “strategic”,“agility” and “innovation”, the Donahoe statement is strategy-speak, run amok. Taking both Ms. Whitman and Mr. Donahoe at face value, i.e. that breaking up into smaller units improves focus, there would be two questions that I would have for them. Until a few months ago, both Ms. Whitman and Mr. Donahoe were arguing, just as strongly as today, for keeping their companies as whole companies, using economies of scale and synergy as their strategic arguments. Were they wrong then or are they wrong now? Alternatively, if there were right both then and now, what’s changed? If breaking up these companies is supposed to improve focus, these companies must have been unfocused before these break ups. If so, who was running these companies, what were causes for the lack of focus and how would breaking up deal with these causes? By being opaque about focus, I think we are missing an opportunity to understand it better and perhaps deliver more value from it. I think that you can look at focus both the perspective of managers and from that of investors. You can look at what caused the lack of management focus before the break up and what will change in terms of fundamentals after the break up (with the resulting effect on value). Breaking up a multi-business company can improve investor focus on the businesses owned by a company and lead to a price effect (even if value does not change). Hurdle rate hiccups: If the businesses owned by a multi business company vary on the risk dimension, it is critical that the hurdle rates used to make investment judgments vary across the divisions (businesses), depending on their riskiness. This fundamental proposition is violated at many multibusiness companies which choose to use one hurdle rate across all their businesses, justifying the practice on the (erroneous) arguments that that is what stockholders in the company demand or that division (business) level hurdle rates cannot be estimated. Not surprisingly, capital misallocation follows, with riskier businesses over investing and safer businesses under investing (and subsidizing the riskier businesses). 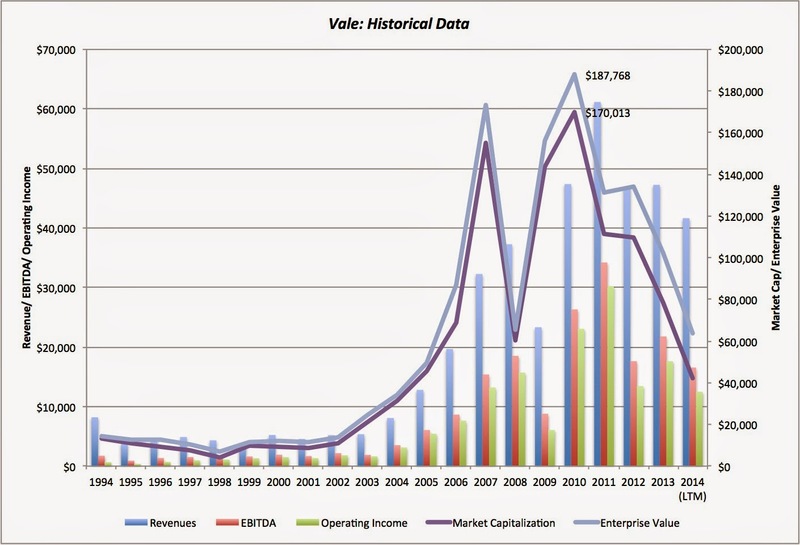 Capital structure fuzziness: The capacity of a business to carry debt is determined in large part by its ability to generate cash flows (with higher and more stable cash flows resulting in higher debt capacity), the types of assets owned by the business (with tangible assets providing more debt capacity) and the tax rate that it faces (with higher marginal tax rates leading to more debt). If a multi-business company has businesses that vary on these dimensions, it will have trouble finding one composite debt mix that works across time and businesses. Dividend policy mismatches: The cash return policy for a business will be driven by its growth potential (with higher growth potential requiring more reinvestment and less cash returns) and the nature of the business (with siome businesses requiring more intensive investments than others). Again, if a multi business company has businesses that vary in terms of growth and reinvestment needs, it may not be able to find a dividend policy that meets its overall requirement. This problem is exacerbated if the company have attracted an investor base that has a particular preference in terms of dividend policy and that dividend policy is at odds with what a business can afford to pay out. The argument that breaking up a company can improve capital allocation, allow for a more optimal capital structure and enable fine tuning of cash return policies to match the specifics of individual businesses will have the most resonance at those multi business companies, where the businesses vary widely in terms of risk, growth and asset characteristics. Thus, it will make more sense for a multi-business company that has a real estate division, a retailing unit, a financial service business and a manufacturing segment within its hold, and even more so, if these units are at different stages of the life cycle, than it will for a multi-business company that is in five mature, manufacturing businesses. Pricing Metric: A multi-business company that operates in businesses that should be valued using different metrics, it becomes more difficult to value the business. Thus, an infrastructure company (where EBITDA multiples may be the most widely used metric) with a financial service arm (where PE ratios or Price to Book ratios are more widely used) poses problems for analysts. Comparable firms: A related point is that pricing is always done relative to a group of comparable firms, usually defined as being other companies in the same business, with additional criteria added for size, growth and risk. With a multi-business company, finding a group of comparable firms becomes tricky, and especially so if the businesses range the spectrum. Controlling for differences: To price a company, you have to control for differences in growth, risk and cash flows across companies, and these comparisons sometimes require market or stand alone accounting information that may be unavailable or unreliable for a multi-business company. In effect, investors are more likely to misprice multi-business companies than single business companies, though the mistakes can cut in both directions and the degree of misplacing will be greater, if the reporting is opaque and the pricing approaches vary widely across the businesses. In my view, this may be just as good an explanation for why there is a conglomerate discount as the more conventional operating inefficiencies story. Looking at the evolution of the two businesses over time, they seem to be following different paths and operate in very different competitve spaces. The marketplace unit has seen slower revenue growth and higher operating margins that seem to be under pressure, dropping from 46% in 2006 to 35% in 2014. The payment-processing unit has higher revenue growth and while its operating margin is lower than that of the marketplace unit, it has also held up better over the last three years. At the risk of stating the obvious, a break up can affect value, only if it affects the inputs into value, i.e., cash flows, expected growth, the cost of capital or the length of the growth period. In effect, if EBay breaks up into two units and the composite cash flows, growth rate, growth period and cost of capital for the two units remains the same as the consolidated unit, there will be no value created. In the table below, we start with this presumption, where we allocate the corporate costs across the two businesses, in proportion to revenues, and assume that the growth rates, growth period and debt ratios don't change for the broken up units. The corporate cost story: If the corporate costs, currently $1,819 million for the consolidated company could be lowered by a hundred or two hundred million dollars, there will be an immediate value effect. If the annual operating costs are cut by $100 million, for instance, the value of the combined firm will increase by $2.2 billion. Absent detailed information, I am in no position to argue for or against this possibility but EBay does not strike me as an excessively bloated company with significant (and easy) cost cuts for the taking and news stories like these don't seem to indicate belt tightening ahead. The unleashed growth story: If the broken up units can have a composite growth rate in revenues and operating income that exceeds that of the consolidated unit, there will be a value increase that comes with that higher growth. Of the two units at EBay, the one that seems most likely to benefit from being cut adrift is Paypal and using a 20% growth rate for the next few years, instead of 15.49%, increases the value of the combined firm by $13.6 billion. There is an argument to be made that the corporate tie between EBay and Paypal has made it both more difficult for Paypal to aggressively go after the payment processing business (especially if doing so will hurt the market place of the business) and for some competitors to adopt Paypal as a payment mechanism. The competitive advantage story: If the broken up units can improve their competitive advantages, relative to the consolidated unit, the higher return on capital and longer growth period that result will increase the value of the broken up units, relative to the consolidated company. Are EBay or PayPal, as stand alone units, likely to have stronger competitive advantages than EBay does has a consolidated company? I don't see a reason why but I am open to suggestions. Lower cost of capital: If the broken up units are able to adopt financing mixes that better reflect their standing as businesses, it is possible that the costs of capital will decline at the broken up units, relative to the consolidated unit and increase value. This argument would have more basis, if either of these businesses had the capacity to carry substantial debt on their own but not as a consolidated unit. In fact, changing the debt ratio for the units to 20% (while increasing the cost of debt to 4.5%) from the current debt ratio of 10.71% increases value only by $479 million, increasing it to 30% (with a cost of debt of 5%) leads to an increase in value of $655 million and increasing it beyond 30% actually lowers value. The spreadsheet that I attach can be used to tweak each of these numbers, to see the impact. I remain skeptical on the cost-cutting, am open to the possibility of higher growth, but I don't see much of a basis for the increased competitive advantage or cost of capital stories. It is possible that the motives for this break up have nothing to do with management focus and value enhancement and have more to do with investor focus and price enhancement. EBay has two very different businesses in its consolidated unit that should be priced relative to different sectors and using different multiples. It is possible that investors (and analysts) are comparing EBay to the wrong set of companies, using the wrong metrics, and are thus mispricing it. The pricing effect of the break down will depend in large part on the comparable companies used to value each unit, the pricing metric used in that unit and any adjustments made to the multiple to reflect EBay's unique qualities. For instance, applying the median EV/Sales ratios for each sector to the revenues of the two EBay units would have yielded a value of $47.8 billion for the company, much lower than the consolidated company's current enterprise value of $68 billion. 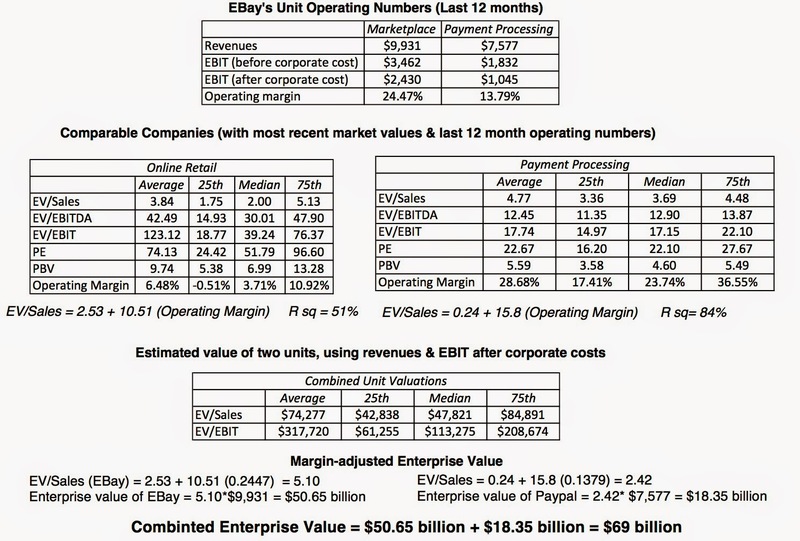 Using the median values of the EV/EBIT multiple to the stated operating income of the two EBay units would have resulted in a value of $113.3 billion for the equity, much higher than the current enterprise value. Bay's marketplace business model keeps its revenues low, since it reports only its cut of the price of items sold as revenues rather than gross revenues, giving it a much higher margin (24.47%) than the typical online retail firm (where the median is 3.71%). 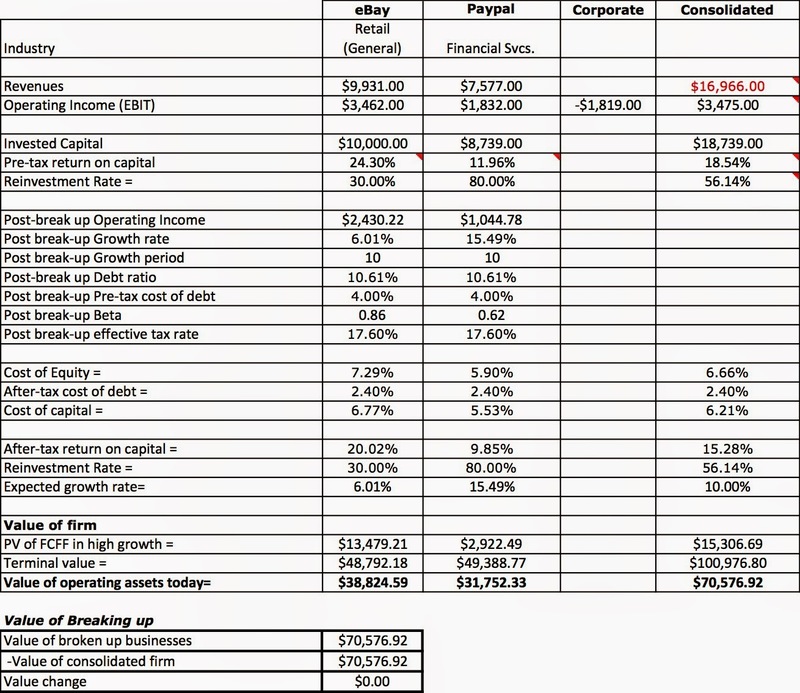 Like many of the companies on the comparable firm list, PayPal derives its revenues from transactions, but its profits are a function of how a transaction is funded, with its highest profits coming when it is funded with a PayPal account balance and its lowest profits from a (non-PayPal) credit card transaction. I also think that two big news stories from the last two months may have also prompted EBay's separation of PayPal. In September, Alibaba went public to acclaim and saw its stock price pop on the offerting date, drawing attention to the fact that Alipay, their payment processing system, would not be bundled with the company. A short while later, Apple announced Apple Pay, a payment mechanism for iPhone users, accepted for the moment by a handful of retailers. With both Alipay and Apple Pay, though, there was talk about their capacity to disrupt the credit card business and the profits that disruption would deliver. As the most established and widely used digital payment processing system in the world, PayPal may very well have resented the fact that they were not spotlighted and blamed their association with EBay for the treatment. Thus, one reason for the timing of the EBay break up may have been the rise in market interest (and valuations) for companies in the digital payment space. In an earlier post, I argued that there was little reason to believe that HP’s break up would lead to higher value or higher price for the individual units, and based my argument not the fact that they are too similar in their fundamentals, with flat and declining growth, and shrinking margins for either value enhancement (from more focused managers) or price enhancement (from more focused investors) to pay off. I have a more optimistic take on EBay’s break up, though it is tempered by my suspicions on motives and timing. Ebay’s market place (the new EBay) and payment processing (the new PayPal) are different enough that managing them as a combined company must have posed head aches for managers. There is also a pricing rationale that comes to the surface, especially with Apple Pay and Alipay being viewed as disruptors in the financial services business, where a stand alone PayPal may attract more attention and perhaps a higher price from investors.